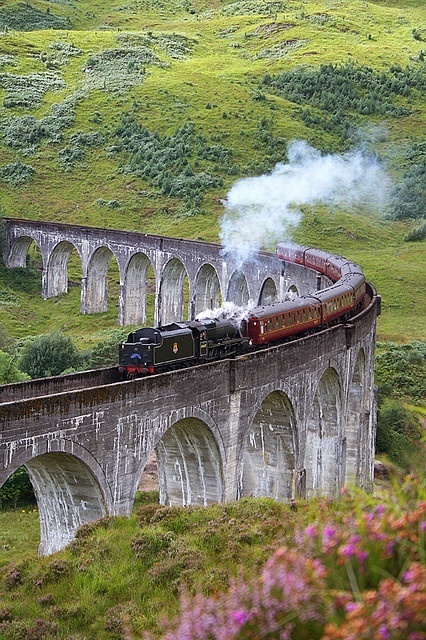 Glenfinnan Viaduct is a railway viaduct on the West Highland Line in Glenfinnan, Lochaber, Highland, Scotland. It was built between July 1897 and October 1898 at the cost of £18,904. Located at the top of Loch Shiel in the West Highlands of Scotland, the viaduct overlooks the Glenfinnan Monument and the waters of Loch Shiel. The 21-arch single track viaduct was one of the largest engineering undertakings using concrete without reinforcing when it was built by Sir Robert McAlpine. Glenfinnan Viaduct forms part of the Mallaig extension of the West Highland Railway which was constructed between 1897 and 1901. Built entirely of concrete, the viaduct consists of 21 arches, each spanning 15m and has a maximum height of 30m offering spectacular views down Lochaber’s Loch Shiel.